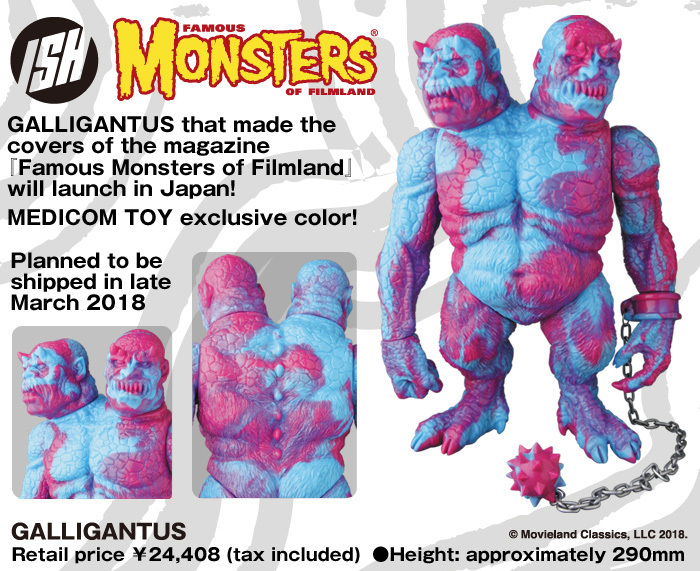 Medicom has released the fourth and final Crazy Color Marbled Galligantus vinyl figure by Justin Ishmael and Famous Monsters of Filmland. This retailer exclusively colorway features a beautiful swirl of blue and pink soft Japanese vinyl. The Medicom Toy Exclusive Pink and Blue Marbled Galligantus stands 11” tall and includes a matching marbled ball and chain accessory. This officially licensed figure is based on the classic Famous Monsters of Filmland 1968 Yearbook cover image by Ron Cobb. Collectors from around the globe can pre-order this beautiful new colorway now at the Medicom Toy online store.